Few things can be as tiresome and inconvenient as waste disposal. Often is seems as if rubbish appears out of thin air and you’re not quite sure when the pile of junk appeared in by your home or office. In fact it is pretty much a natural process. Any household or active business generates rubbish. The bigger the household or larger the business the more rubbish they generate. Not only it takes space, but it also probably smells, is aesthetically unpleasant and is most likely a potential hazard. You could try dealing with the problem personally but that’s not recommended. Why hire us for a rubbish removal job in Liverpool? A much wiser decision is to entrust the waste clearance to trained professionals. Our experts have the skill set and the experience to clear garbage. Each employee has undergone a special training for proper handling off rubbish. All rubbish is handled in accordance to a set of rules and safety regulations – UK and EU law, mandatory industry practices as well as waste handling recommendations by various international industry organizations. It’s handled carefully in an eco friendly with a sizeable percentage of it being sent to recycling facilities rather than landfills. So by going with us you’re also going green. We consider protecting the environment a top priority for our garbage clearance business. We’ll save you time and effort in getting rid of old kitchen appliances, furniture or items that collected dust in your attic that you decided to get rid off or perhaps you think it was time for empty your garage of make room for your car. It’s never too late too free up some space at home. Lay back and leave the heavy lifting to us. Our professionals will be over before you realize they started. 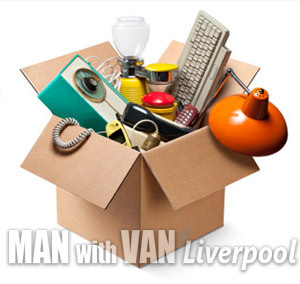 Man With Van Liverpool‘s also offers commercial waste collection and disposal so all that junk your business generates over time or leftover construction materials – gone in no time. No longer you have to considering expensive options such as hiring a skip (which can also require certain permits). Our way is faster, cleaner and less noisy. Call us today and take advantage of our rubbish removal services in Liverpool. Our consultants are prepared to help you decide what type of junk removal service is most appropriate for your particular case. We are prepared to remove the garbage in your house, attic, basement, garden or deal with any commercial waste your business has built up. Please note the offer does not include hazardous waste like asbestos, radioactive materials or highly toxic chemicals.